For many small business owners, managing accounting and bookkeeping can place grueling demands on their limited supply of time and resources. Before important financial responsibilities start to fall through the cracks, consider the outsourced accounting and bookkeeping services offered through Emily Ryan Tax Services LLC. Our reliable accounting services are the smart and economical choice for busy business owners. When we’re in charge of your accounting and bookkeeping, we present a common sense approach with an uncommon level of personal attention and sound advice. We’ll organize your finances in a way that makes sense, is convenient, and makes tax preparation at year-end easier and less expensive. You’ll be free to concentrate on running your business while we handle time-consuming tasks like monthly closings, financial statements, and bank reconciliations. Even though we’ll be doing the heavy lifting, we’ll make sure you’re still in control and always have access to the essential financial data you need to make important financial decisions. 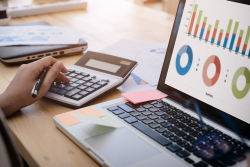 Contact us at 801-375-7515 or request a free consultation online to learn more about why outsourcing accounting and bookkeeping to a local Provo, UT accounting firm is a smart move for small businesses.